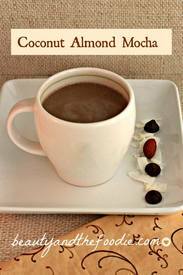 A paleo cafe mocha with “almond joy” candy bar flavors. Grain free and includes a lower carb version. Sometimes you want something warm and a little sweet to start your day. When it is hot again outside I will make a frappuccino with this recipe. But I decided, with the colder weather, that I really would prefer a hot beverage. I will blend this up with ice. For the low carb version you can use the unsweetend chocolate almond milk and leave out the cocoa powder, or use regular unsweetened almond milk and add the cocoa powder.